A sweeping path leads up to the sandstone laid front porch, called thinnai. For a brief moment, the guests’ murmurs abruptly change into whispers of delight. The aroma of freshly ground spices, the unmistakable scent of jasmine, the refreshing coolness of coconut and sandalwood tilakas are strong sensations, eliciting gasps of wonder.As the marriage party enters the wide arched Chettiar mansion, greeted  by the words "Vange Vange" meaning "Welcome, welcome", one's attention is drawn to the stone floors, lime plastered walls, teak pillars, locally made Atangudi tiles, tiles from Bombay and Germany, Italian marble, Murano glass, Indian Charnockite, ceiling tiles that have a very strong Spanish influence and intricate door carvings. As my eyes wander over this mansion in Chettinad, there is a sense of awe taking over me—the house is over a century old, dotted with Belgian chandeliers and sepia-toned memories of old radios, photo frames and what comes across as a mélange of architectural styles- the result of the influences of the extensive travels of the prosperous community. The Chettiars made their mark as a business community, fond of utilizing their wealth in private and public spaces. Chettinad, even today, is a memorable peek into the past—of grand mansions, tree-lined boulevards and wide roads. I have been invited to attend a Chettiar wedding—perhaps the grandest way to look into the lives and traditions of the people. Although, like most communities, the Chettiars  have witnessed substantial social changes in the past decades, their marriage ceremonies are still a remnant of the past. A wedding can last up to six days but the most poignant ceremony is of the muhurtham, quite literally, the ‘curtain drop’ signifying the union of the bride and groom. The Chettiars tend to marry within their own community and as I soak in the stories, my friend’s mother-in-law enchants me with her tales of chaperoning! Dressed resplendently in a crisp, bright silk saree and donning gold jewellery passed on from generations, the lady sits close to me and I catch a whiff of coconut and jasmine from her freshly oiled hair. She narrates how, in her time, young women were always escorted to college and ushered hastily away from the sight of young men! Our conversation ends shortly, because nothing catches the imagination like a good Indian meal. Although Chettinad chicken is very popular across the country, the local cuisine subtly mixes flavourful and fiery spices. Paniyaram (fried dumplings), a variety of chutneys, idiappam (string hoppers), kosumalli (local stew)and meen kuzhambu (fish curry) are only some of the wide variety of dishes served to guests on banana leaf 'plates'. In Tamil Nadu, it is said that one is lucky to eat like a Chettiar. 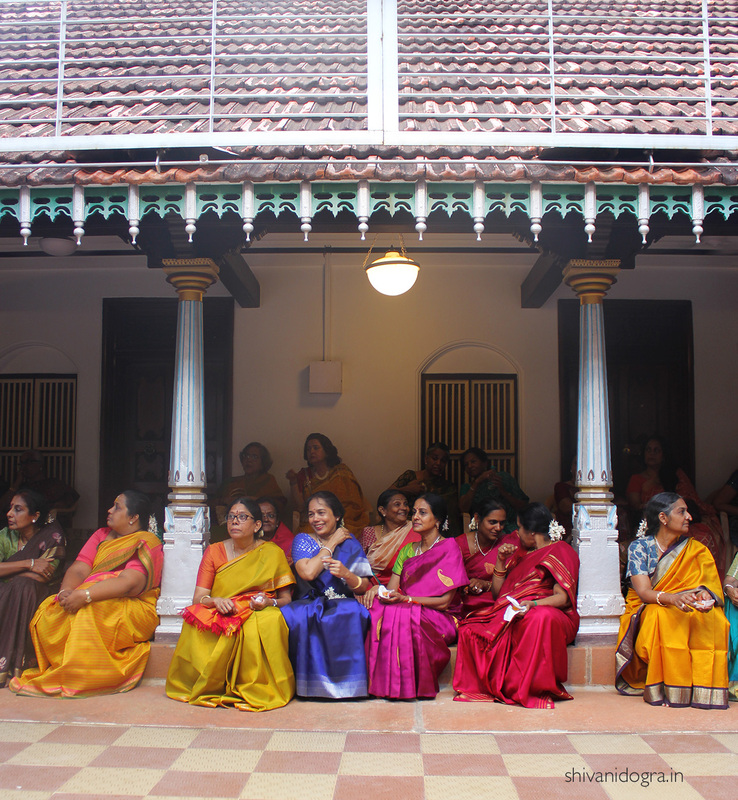 Amidst the 15,000 old, crumbling mansions of Chettinad, I would say one is lucky to live like a Chettiar.